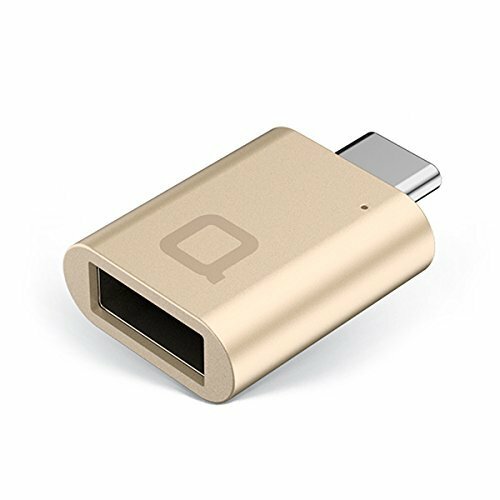 Home › Electronics › Nonda Usb-C To Usb 3.0 Mini Adapter [World's Smallest] Aluminum Body With Ind..
Nonda Usb-C To Usb 3.0 Mini Adapter [World's Smallest] Aluminum Body With Ind..
Color: Gold Introducing the world's smallest USB-C to USB-A adapter. Use it to charge upyour phone and other standard USB devices or transfer data at USB 3.0SuperSpeed (up to 5Gbps). Made out of durable aluminum alloy, the mini adaptercomes in 3 colors to match the new MacBook 12-inch. It's also compatible withthe Chromebook Pixel and other USB-C devices. From the Manufacturer USB-C to USB A 3.0 Charge up your phone, iPad or any other standard USB device while you work andtransfer data at USB 3.0 SuperSpeed (USB 3.1 Gen 1), which supports up to5Gbps. The World's Smallest USB-C Adapter The mini adapter is made to be compact and highly portable, so that you cantake it with you anywhere. Tuck it into your bag, pocket or wallet whileyou're on-the-go. Designed in Germany The USB-C to USB-A mini adapter was designed in Germany to be both sleek andhighly functional. Matches Your MacBook Available in 3 colors to match the Apple MacBook 12-inch. Durable Aluminum Body Made out of high quality aluminum alloy to be drop-shock resistant. To create top quality smart devices that solves everyday problems. nonda is a smart hardware startup based in Palo Alto, California. We're agroup of smart hardware enthusiasts, app developers, go-getters, and industryspecialists. We love what we do and hope to share our vision of what thefuture of smart hardware will look like with the world. In 2016, two nondaproducts won the prestigious iF and Reddot Design Awards for best productdesign. About the Startup Describe your product in 3 words. Sleek. Portable. Durable. How did you come up with the idea for this product? When the MacBook 12-inch came out, we loved the concept of a super thin,highly portable working device. But we soon ran into a major problem. Wecouldn't connect our USB devices to our laptops as we used to, which disruptedour workflow. So we decided to tackle the problem head-on and came up with asolution that we're pretty proud of. What makes your product special? We designed the mini adapter to have the same elegant feel and quality as theApple MacBook 12-inch. It's even constructed from the same aluminum alloymaterial. Because it's light and compact, the mini adapter provides a workingsolution that perfectly complements the MacBook's portability. What has been the best part of your startup experience? The best startup experience so far has been seeing customers rave about aproduct that we've spent months designing, prototyping and testing. It makesit all worthwhile. We get really pumped up by being able to make a differencein someone's day through our product experiences.